The U.S. Supreme court dodged a major ruling on the question of whether business owners can refuse services to gay individuals based on their religious objections. Writing for the case, Justice Anthony Kennedy said that while it is unexceptional that Colorado law "can protect gay persons in acquiring products and services on the same terms and conditions that are offered to other members of the public, the law must be applied in a manner that is neutral toward religion." 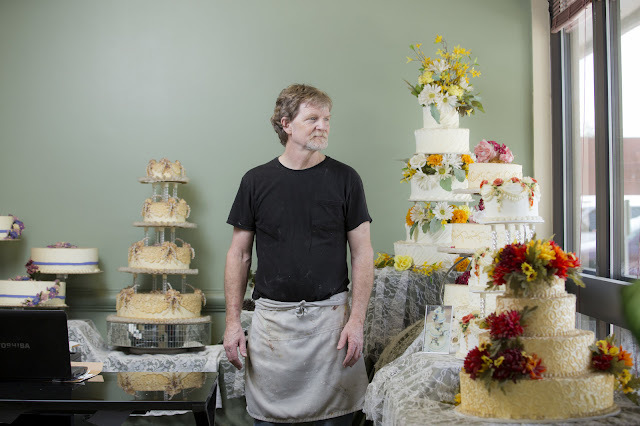 He said that in this case the Colorado baker, Jack Phillips, understandably had difficulty in knowing where to draw the line because the state law at the time afforded store keepers some latitude to decline creating specific messages they considered offensive. Kennedy pointed to the Colorado commission's decision allowing a different baker to refuse to put an anti-gay message on a cake. Justices Ruth Bader Ginsberg and Sonia Sotomayor dissented. The court's four most conservative justices, including Chief Justice John Roberts, concurred with the decision offering different rationales for the future. One assumes, then, that those with 'religious convictions' are 'privileged' (if one can use that word in this situation) to set aside the law in cases like this, something which would be denied to anyone who is NOT religious. It frightens and saddens me to think how many would shout "Yay" to this.